Intel SE7520BB2, Bulk without accessories. 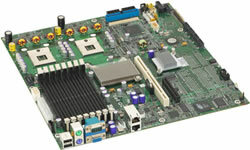 The Intel® Server Board SE7520BB2, supported by two Intel® Dual-Core Xeon® processors LV and the Intel® E7520 chipset, meets the needs of space and power constrained data centers and high performance computing environments. Support teaming and failover, 10BASE-T, 100BASE-TX, and 1000BASE-T with RJ45 output. IDE: One legacy IDE connector, support two IDE devices. Parallel ATA: Single-channel ATA-100, support two IDE devices.